Music can do many things to the body but for me there is nothing more beautiful than feeling it float through the essence of your being. Music can be many things, from the simplicity of an acoustic guitar to the rhythmic pulses of electronic beats and lush soundscapes of full orchestras, I can listen to anything and everything providing it comes from a place of positive creativity. Music can be thought of as the flow of many individual sounds, with each variation of sound creating a vibration that travels as a sound wave. As these sound waves reach our bodies, they enter our energy fields through the 7 main chakras, or energy centres, which in turn exist within a harmonic of frequencies starting at the lower 256Hz of the Root Chakra through to the higher 480Hz at the Crown Chakra. Striking a Quartz Crystal or Tibetan healing bowl is the simplest way of touching each chakra as these healing tools are formed to match the frequency of the chakras and will provide direct resonance to clear blockages or restore imbalances. So when we tune into the energy of our bodies and feel music rather than just listen, we are able to isolate the sounds and become aware that we are actually feeling the bass notes through the Root Chakra, the higher notes through the Crown Chakra and everything else in between. Barbara Hand Clow explains that sound emanates from the 7th Dimension, the realm of vibrational resonance, in the context of 8D being the realm of Light, 7D being the realm of resonance, 6D being the realm of geometry, 5D being the realm of love, 4D being the realm of the collective and 3D being the realm of space-time. In this sense, light creates sound which creates structure which creates form. Sound is pure and as everything within our Universe exists as vibration, the energy set within the harmonics of sound is also transferrable so when a musician is connected to Source energy, as is often the case during the creation of spiritual or meditation music, and particularly so with a singer using voice as their own personal expression, that energy will transfer to the listener. This is why we are so easily uplifted and inspired by beautifully crafted music and feel light, clear and elated after experiencing the more direct affects of sound healing work or sound meditations. 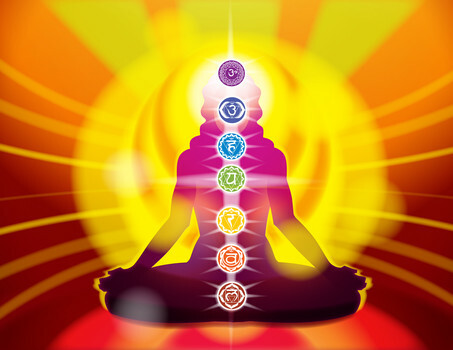 But whatever the style of music, when it resonates with the harmonic frequencies we naturally hold, it can change us on a much deeper level, prompting emotional responses relative to the chakra centres being touched and in the process, offering healing to the body in one of the most enjoyable ways.